I have a new entry for “best actual headline that could be a Babylon Bee headline.” My last post on Mark Driscoll and this one are in hot competition for winner in that category. 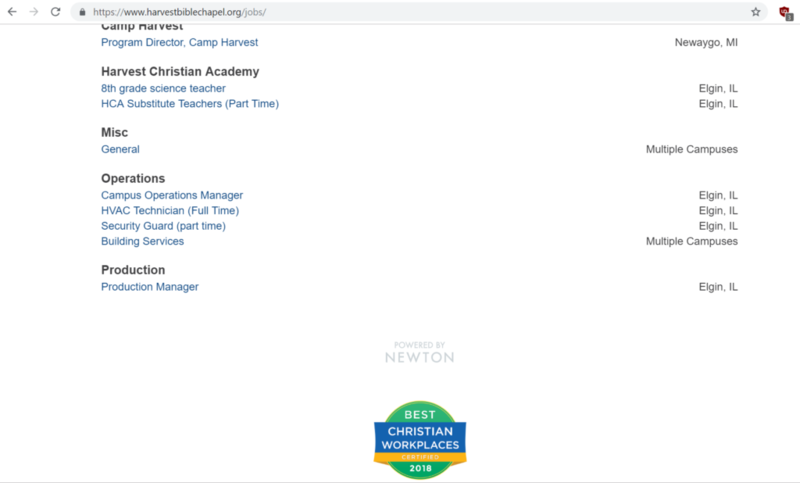 Yes, something called the Best Christian Workplace Institute has certified Harvest Bible Chapel as the newest best Christian place to work. Congratulations to our newest #BCWI Certified Best Christian Workplace: Harvest Bible Chapel @HarvestBible1. Many blessings on your thriving ministry! Was it the on again-off again lawsuit? Was it the regular turnover of staff? The tell-all articles in the newspapers by former volunteers and members? Was it the peacemaking process which began with the abrupt firing of a ministry “partner?” Was it the need for a peacemaking process at all? Generally, BCW Institute doesn’t get responses to tweets — except this one. So far, 32 responses have been left for BCW asking how a church with such public difficulties can be rated as a great place to work. I sent BCW president Al Lopus an email and a couple of tweets asking questions about how churches can earn the rating. No answers as yet. These ratings are often used by organizations to prop up their image. Gateway Church was rated highly the year they laid off 30% of their staff. Insiders tell me that the staff have to fill out the forms and are monitored. In other words, it would be quite possible for an organization to cook the books. Perhaps, Mr. Lopus can enlighten us. Oh, maybe this is the reason why HBC is such a great place to work — free therapy. Seriously, don’t do this. This isn’t how exposure therapy works. It may have been staged, I don’t know but if not, this isn’t a safe way to work. A commenter pointed out that the church has already added the seal of approval.